Waiting, but not giving up on your dreams! If you spend any amount of time with me, you’ll find out quickly how much I LOVE Ethiopia. My family was blessed 8 years ago when we adopted our beautiful Ethiopian son, Messay. Even as a child, I knew that I would do missionary/humanitarian work in Africa. After we adopted Messay, I was sure that we’d be going back soon. We even talked about spending a year there, working and serving. But then… LIFE here got in the way. I was a stay at home mom to 3 small children. My marriage went through a very difficult time as my husband lost his job, and struggled with depression and PTSD. It took awhile, but he got healthy, changed careers and we got our marriage back on track. After everything we’d been through, I wasn’t sure that my dreams of working/serving in Ethiopia were ever going to happen. Well, fast forward five years… I am now on the board of directors for Habesha Momma. (In another post, I’ll share the amazing story on how I am became part of this awesome organization!) This summer, I am getting ready to head back for my third trip to Ethiopia! 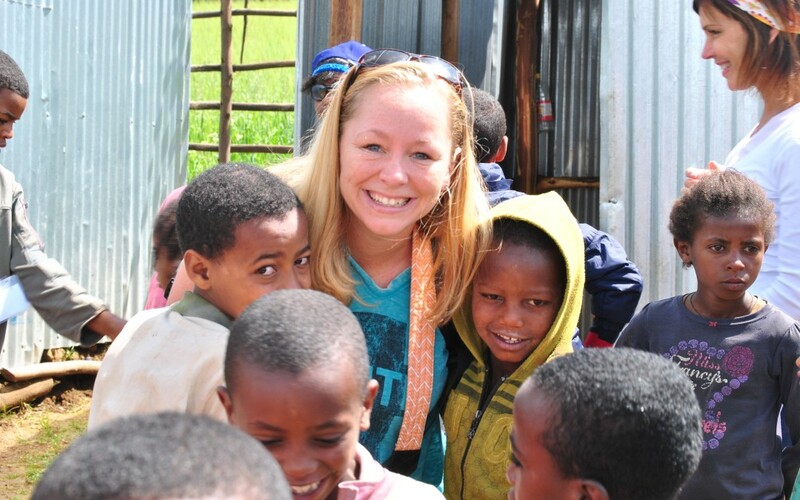 I’ve built water filters, painted a mural in our school, played with and fed hungry children and made life long friends with Ethiopians working hard to better their country. I’ve been able to show my Ethiopian son that his family here loves his culture and heritage. There is SO MUCH work that can be done in Ethiopia and, while I know I can’t change everything, I am so very happy to be doing something for the country that gave me so much. It has made me look back on my life, my dreams and my desires. I have had this dream in my heart for so long. If you would have asked me in college, I would have told you I would have traveled the world helping children. I would have gone on many mission/humanitarian work trips. I might have even joined the Peace Corps. My life however, took a different turn. I graduated college, got married, became pregnant, and had a baby all in the same year! A year later I had another baby. We were a military family, so every few years we were moving and starting over, and much of the time, I was living the life of a single mom, while my husband was deployed. There was no time to follow my heart to Africa; not while I was building and raising my family! Do you have a dream or a desire you have had for awhile and you just don’t know if it’ll come true? Things you think such as, “Well, if it hasn’t happened by now, it will probably never happen.” Please don’t listen to that voice! Times can change and all of a sudden you may look around and SEE your dreams coming true. Don’t give up on the plans you have for your life, even when they seem impossible. Slowly make changes in your life for the better. Keep praying and dreaming. Talk to people about what your future will look like, even if you aren’t sure how you will get there. Don’t give up! Your dreams are important and the people you’ll touch with your dreams are important, too. All I have to do to remember that is look at these beautiful faces. Find what keeps your dream alive and go for it!